I started working on this straight after I came back from my last Goldhawk Rd visit so.. February. 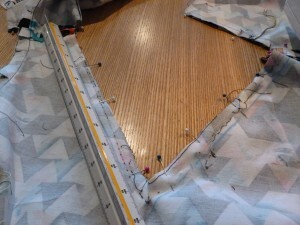 In fact, I just checked the date on the photos from cutting out the fabric – 26th of February. Sigh. 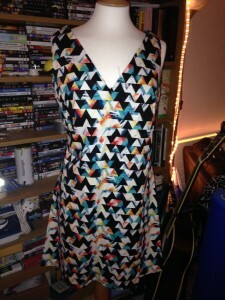 I used the same Jiffy pattern as for my black and white dress I had made recently and had run up very quickly. 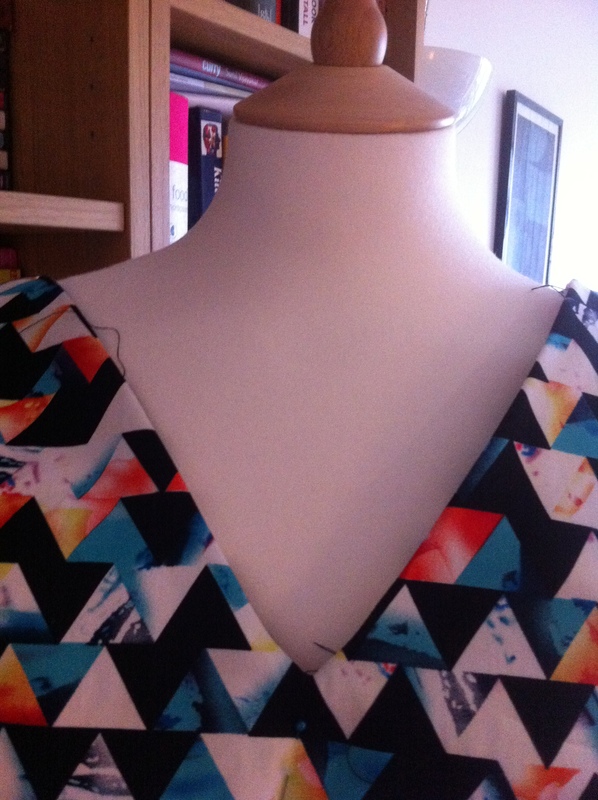 I (in hindsight, foolishly) decided to make some modifications – a v-neck (using another pattern) and tab detail around the neckline. I thought the triangles in different orientations would look pretty cool. 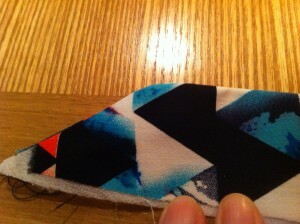 I was also planning black piping around the edges. Yes, in hindsight… ambitious. 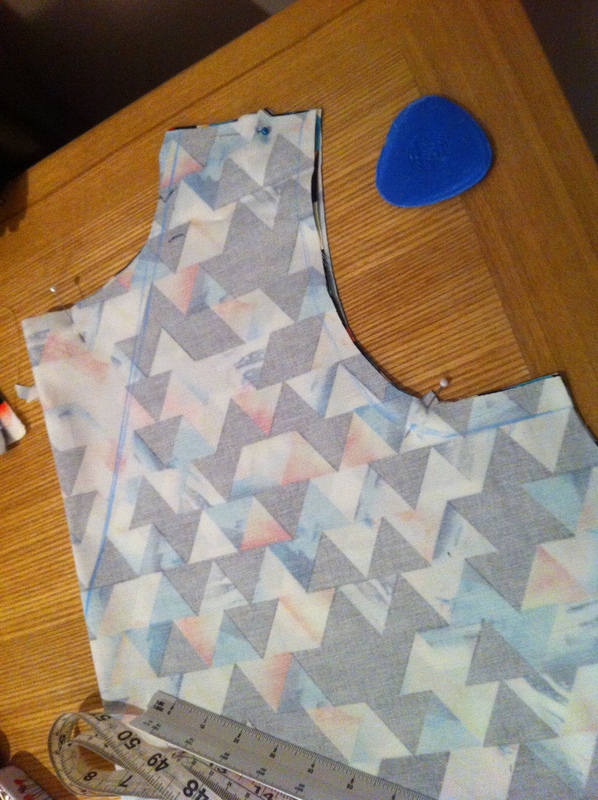 I was pretty pleased with the jazzy tabs I cut out to put around the neckline. But actually placing them was a bit of a nightmare. The neckline ended up pretty bulky and it was difficult to achieve any kind of neat finish. 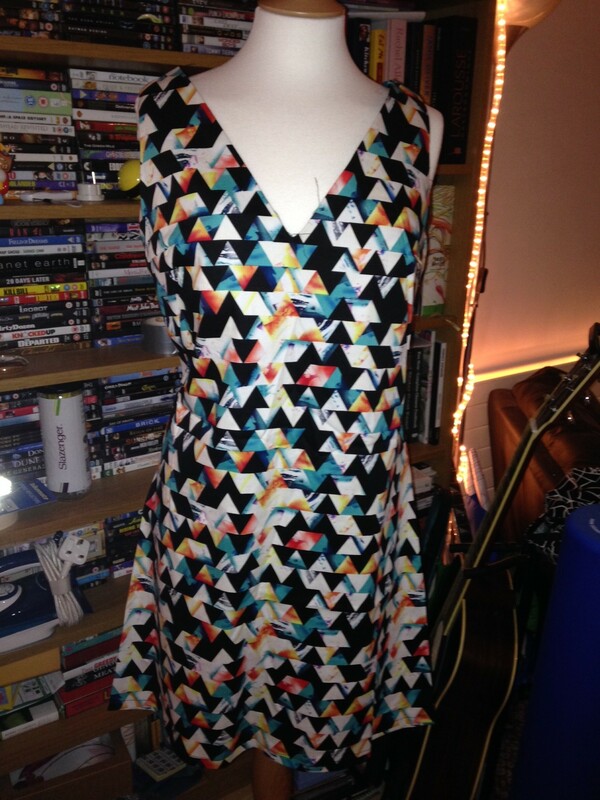 So… after spending a LOT of time fiddling around with it I decided to abandon the tabs and just sew it up and just FINISH THE DRESS! Pretty crappy looking eh? 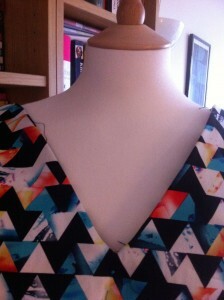 Top tip: avoid impromptu v-necks on fabrics with a pronounced triangle print! 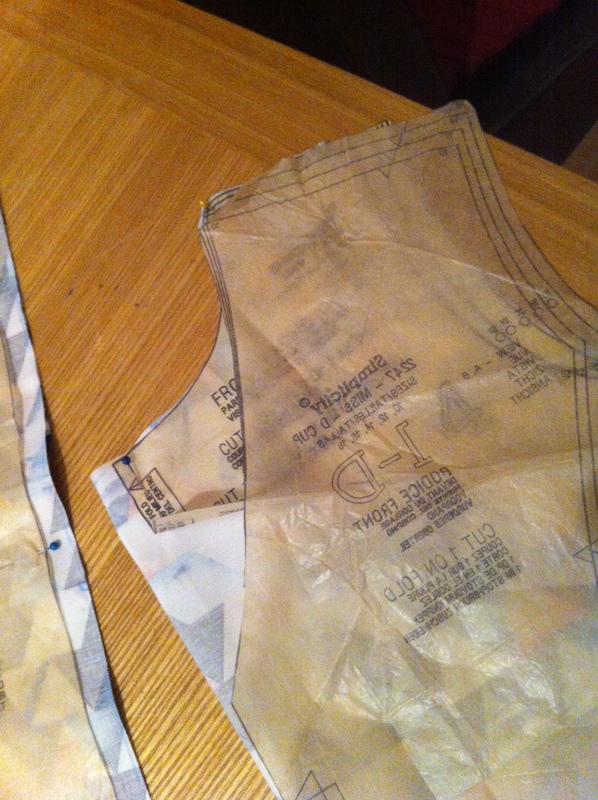 Back to the drawing board… I re-did the v-neck to match in with the fabric. …And sewed it back up. The result is the photo at the top of the post. Definitely an improvement but when I put it on the v-neck wouldn’t sit flat at all. GAHHHHH!!!!!!!! So this project has been moved, after a LONG time working on it, to the Limbo Pile of Death (TM). Hopefully to be fixed at some point but for now… I’ve moved on to other stuff for my own sanity! Quite a few projects have been placed in limbo over the last few years but this is the first one in a long time and it stings! Still, I have made a few things in the mean time so I’m back on the horse so to speak. You’ll be surprised to know I have made no pattern mods! Not to be too dramatic about it but… Time-sapping disaster. Some more positive posts to follow – promise! 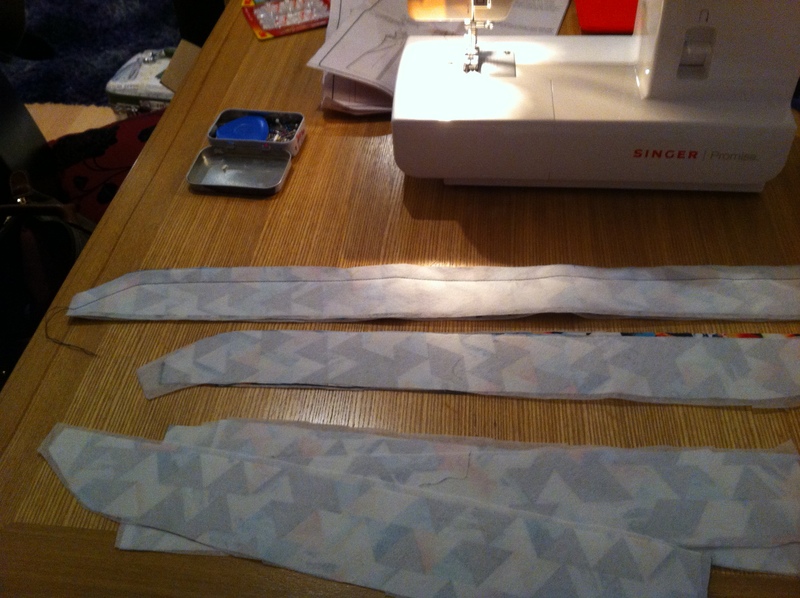 This entry was posted in Limbo Pile of Death, Off pattern adventures, Simplicity by Aoife. Bookmark the permalink.